In order to email or text someone in Timecounts, that person needs to have 'opted-in' (given explicit permission) to be contacted by you. 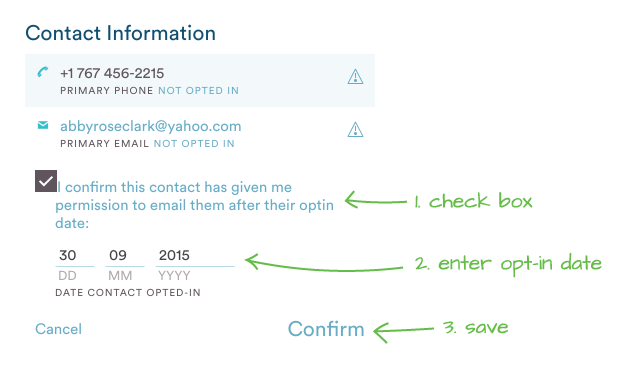 Opt-in information can be imported, added manually for individuals, or included with email and phone fields in form responses. We ask for opt-in information with the two checkboxes on the Import page. You are asked to check 'I have permission to email these people' and/or 'I have permission to send SMS texts to people with a phone number'. If one or both of these boxes are not checked, you will not be able to send emails or SMS through Timecounts to the people you import. If you have a mix of opt-in rules in your spreadsheet, you can import individual opt-in dates (YYYY-MM-DD) in a spreadsheet column, and leave these boxes unchecked. You can view and edit an individual's opt-in settings in their profile card. 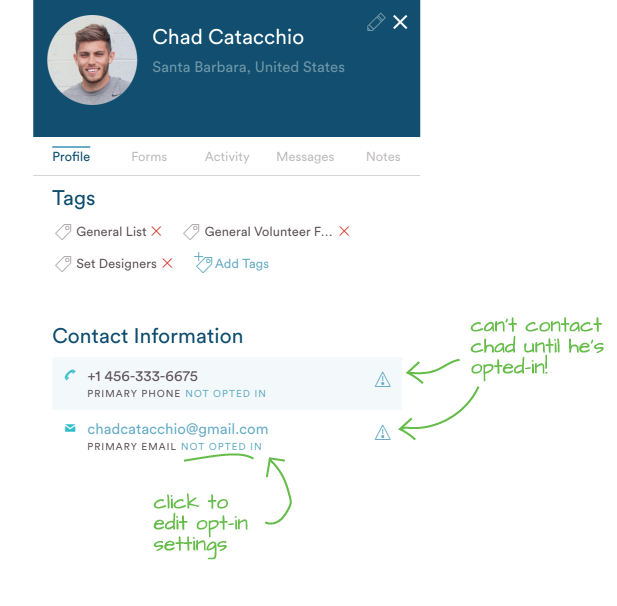 Any phone and email field on the profile card will have opt-in settings attached. Click on the text 'Not opted in' to confirm an opt-in date. This is the date when the individual gave you explicit permission to contact them. If you're unsure, contact your volunteers outside of our system to ask if you have permission to send emails and/or SMS texts about volunteer opportunities. They can unsubscribe at any time.